We have been singing and dancing to "Under the Sun" by Frank Leto as well as the Lilo and Stitch soundtrack. I thought it would be fun for the kids to have a costume to sway in. 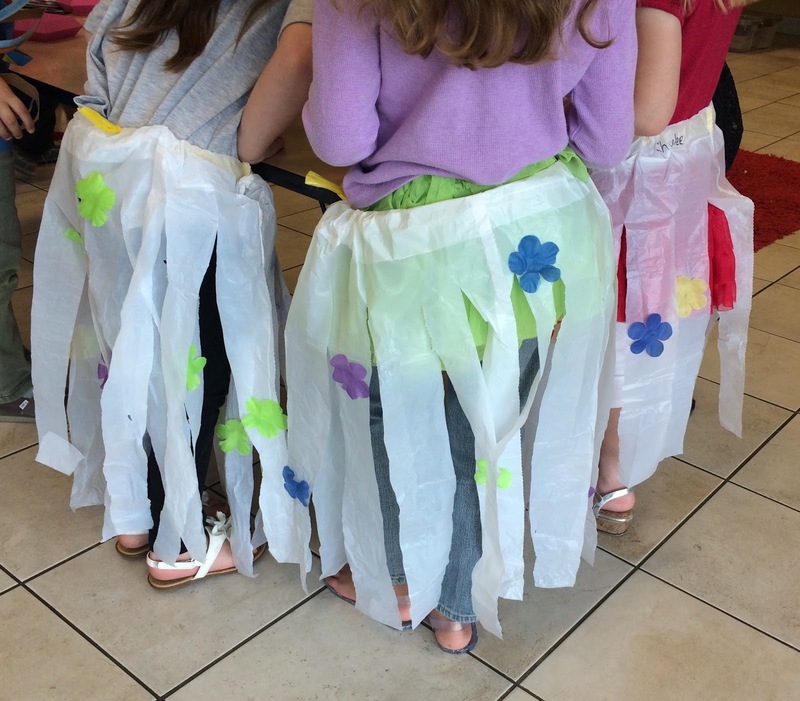 So we made these cute hula skirts. We bought white garbage bags and a few fabric lei's (3 for $1). I cut the strings on the lei's and took off the flowers. 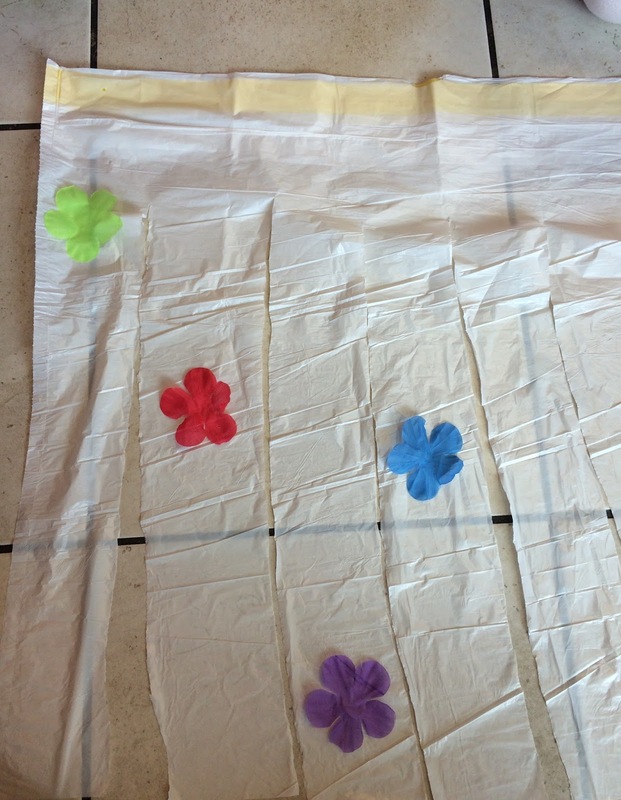 We then cut the bottom off the garbage bags and cut strips up to the ties. 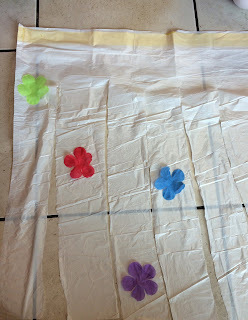 Then we hot glued the fabric flowers onto the strips of plastic. Flip it over and do the same on the back. The ties become the waistband. Just cinch them up and tie. Our cute little hula dancers ready to play and dance. 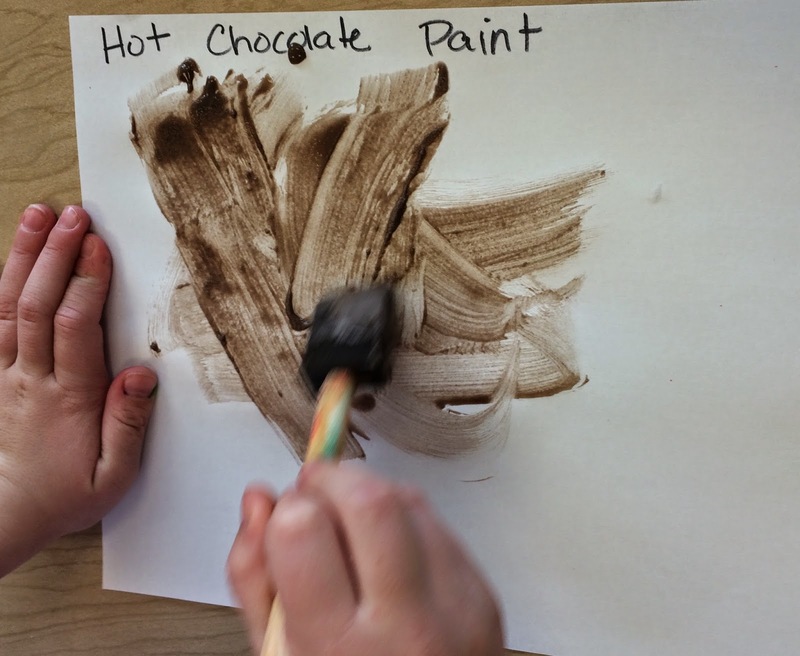 Who knew hot chocolate made good paint? We tried this the other day and it was a big hit, not to mention, smelled fantastic! 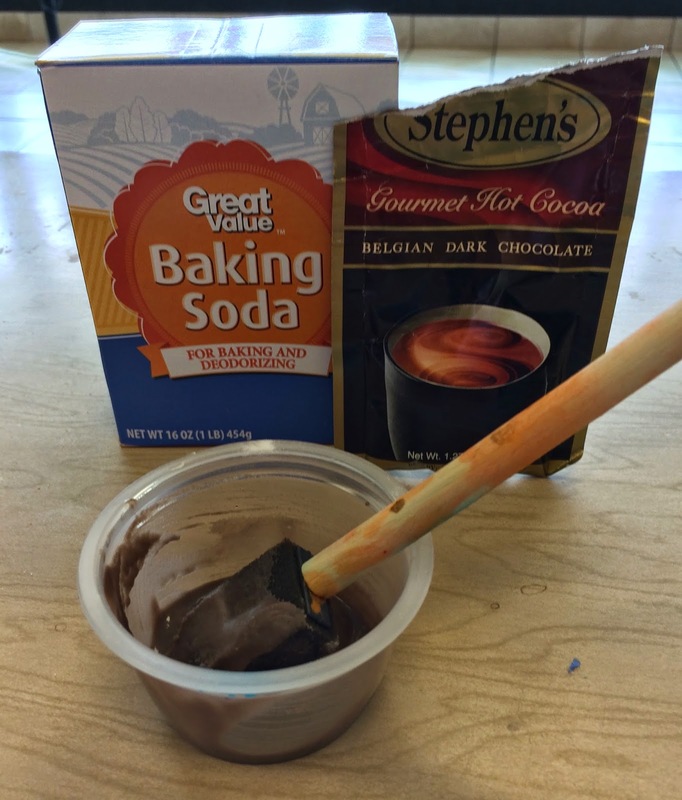 We mixed some hot chocolate mix, with baking soda and a bit of water. Sorry, I don't have exact measurements. I just added and mixed until I had the consistency of paint. We used baking soda because it's what I grabbed first, but I think corn starch would work too. The kids had a great sensory experience with it and wiped the container clean of the paint. It's a great way to get your chocolate craving with out all the sugar! Fun, fun, fun! How fun are these little canoes. You have everything you need right now to make these! I cut this one in half, but you could leave it whole too. 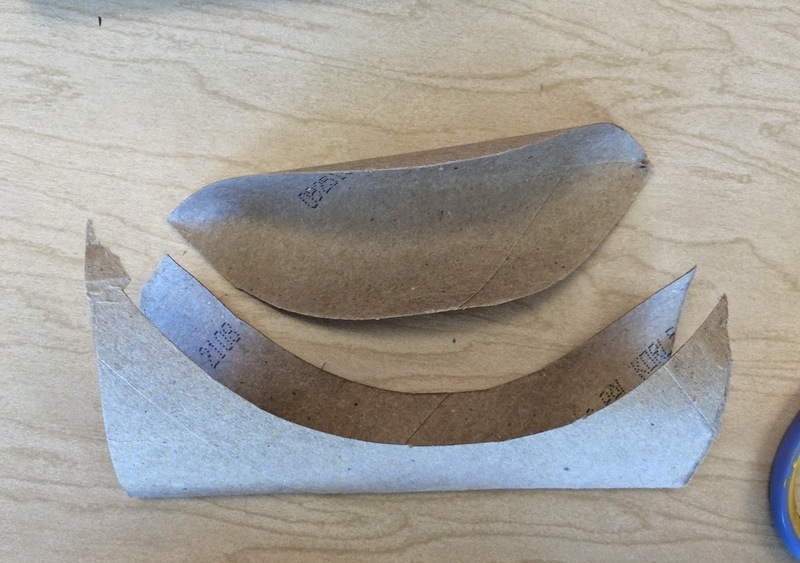 Cut the middle out of the paper roll. Have the kids decorate with your choice of medium. We used crayons so we would be able to play with them right away. Staple the ends together and BAM...done! So fun and easy, right? Enjoy! 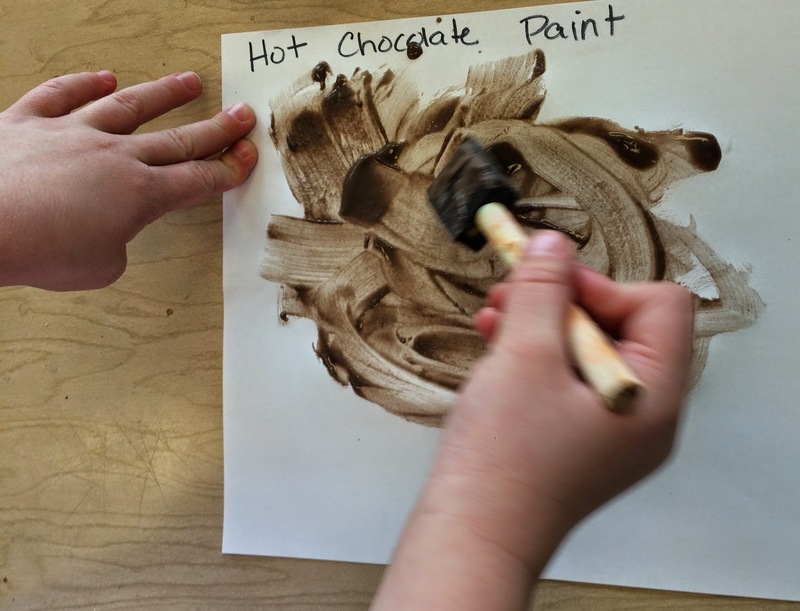 Painting with ice is a fun way to create and is a great sensory experience for little ones. We have painted with ice cubes before but I thought the kids would be able to paint longer if their hands weren't frozen. So, I froze water in popsicle makers. 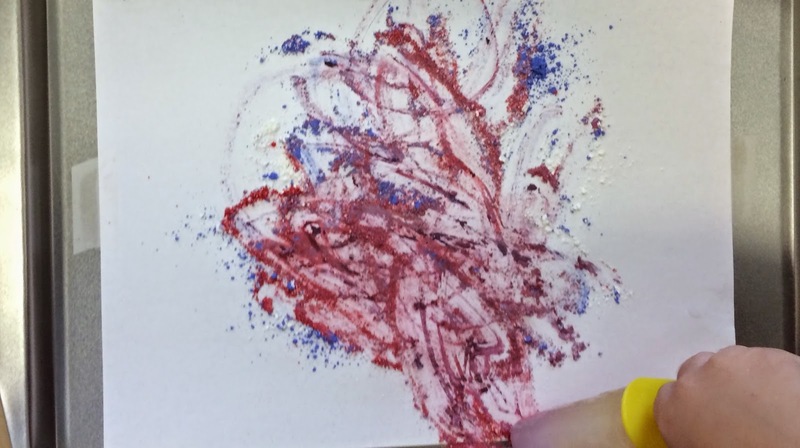 We sprinkled powdered tempera on our papers. Empty spice shakers are perfect for this! 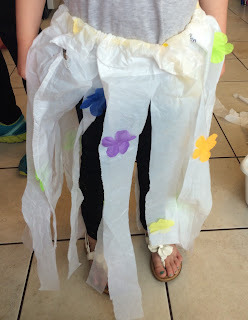 Then I let the kids create away. 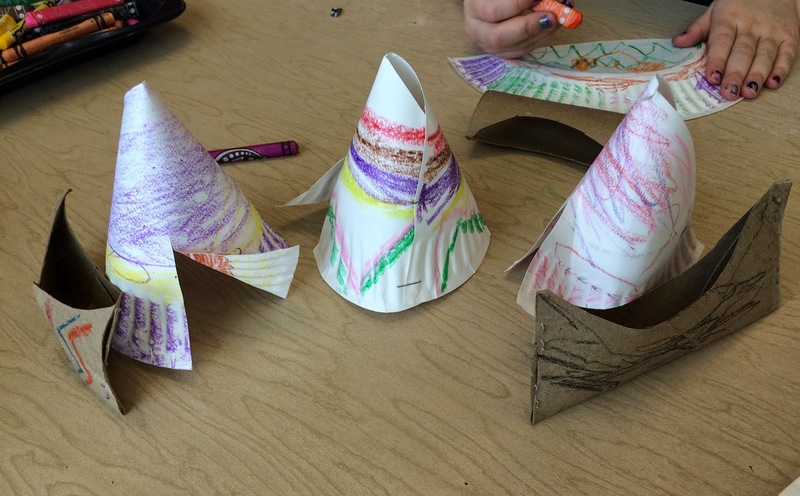 We had so much fun making these cute little wigwams. 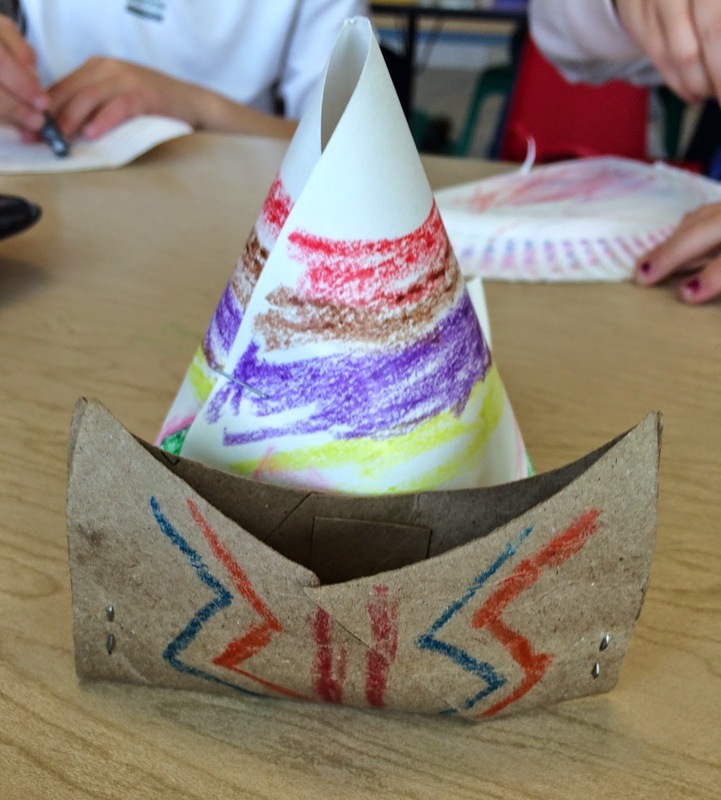 We had a discussion on what a "home" can look like and included igloos and wigwams in our discussion. 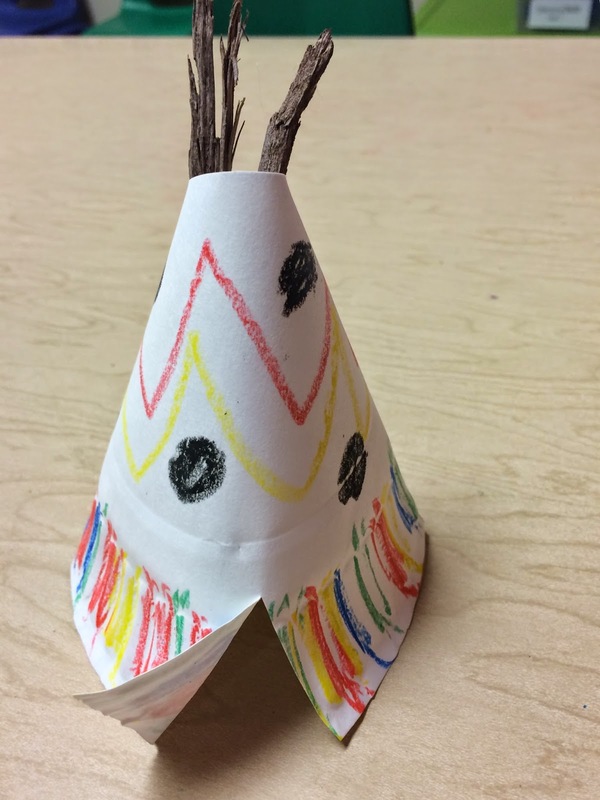 We made these paper plate wigwams to use with our little painted peg people. 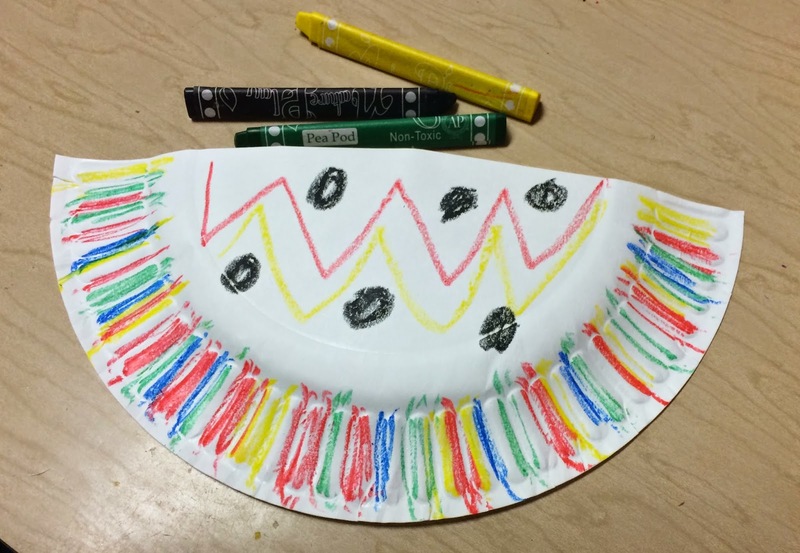 We cut a paper plate in half and then colored our designs on it. 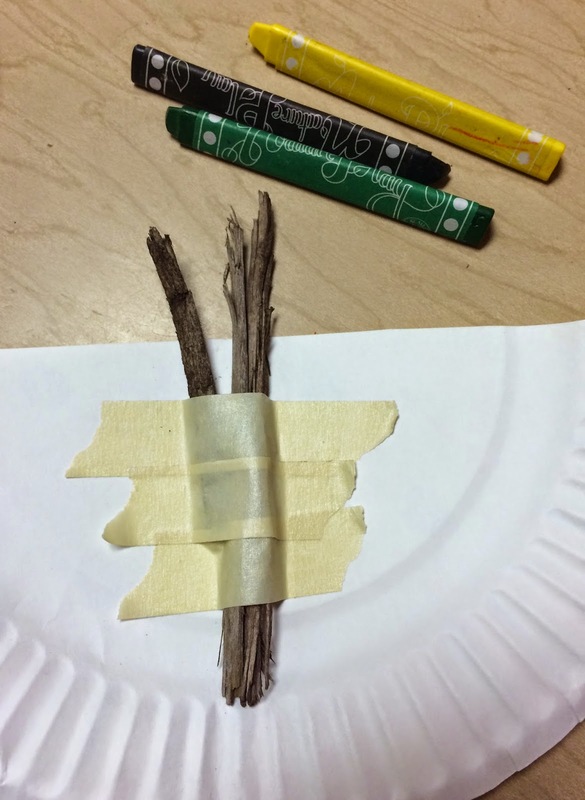 We collected some sticks from outside and taped them to the inside of the plate. 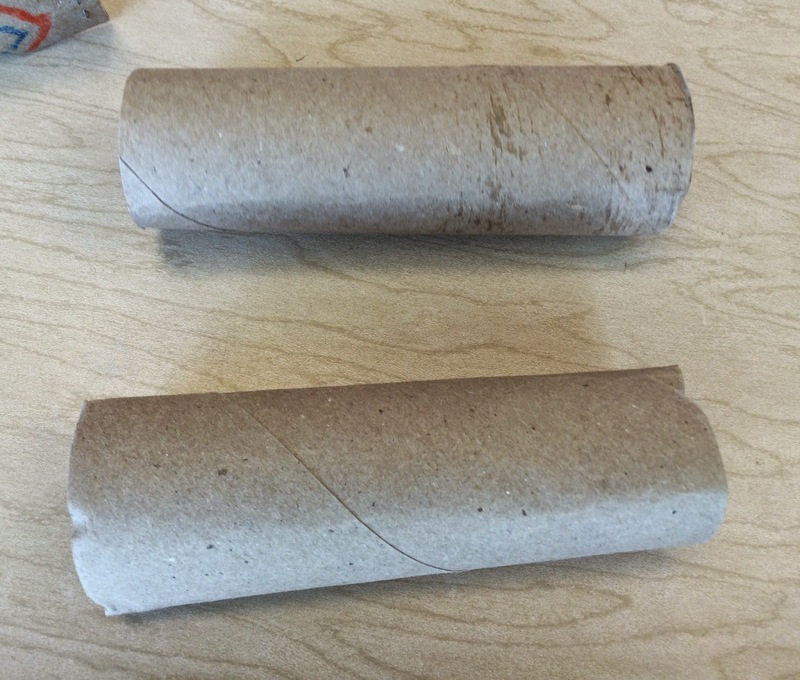 Then we rolled the paper plate into a cylinder shape and stapled it shut. Cut your little door and your done. Easy, cheap an super fun. Okay well, not really, ice.... but "icicle looking" might be more accurate. My kids loved making these and squeezing the glue bottle onto the triangles is an excellent fine motor strengthening skill. Yay! Cut triangles through center. 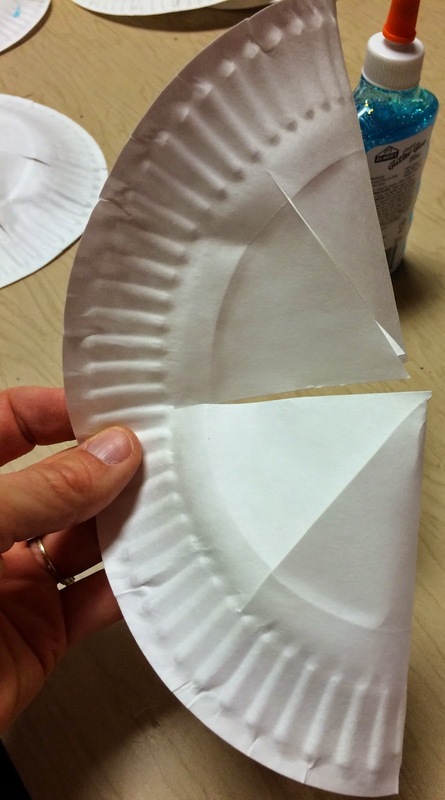 When you unfold the paper plate, you might need to cut a few more triangles on the sides. The kids used crayons first to color around and on the crown. 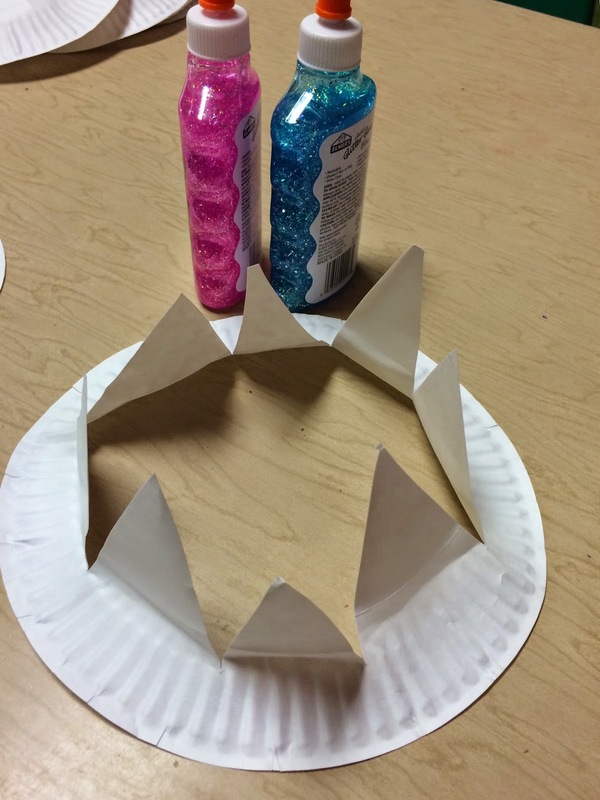 Then we folded up the points and added some glitter glue. Then put it on and do a little ice dance! Or not, whatever. Some of my kids have very large brains so I had to cut the crown and staple a little strip of paper to help the crown go around their little heads. The kids love to use the potato head pieces with the play dough. I just love seeing what characters they create with them. I will post a recipe for the absolute best play dough I have ever made, but before that, check out some of the play dough people my Little's created. Here is the best play dough recipe I've ever made. you can either add a packet of Kool Aid, or food coloring if you wanted to add some color. Mix it all in a sauce pan and stir on medium/high heat. Stir and stir until it begins to form a ball. Dump the dough onto the counter and allow to cool. When it cools, knead it for a few minutes and your done! So easy and super soft. If you keep it in a zip lock baggie or air tight container, it will last weeks.